Jake Arrieta's still a top of the order starter. 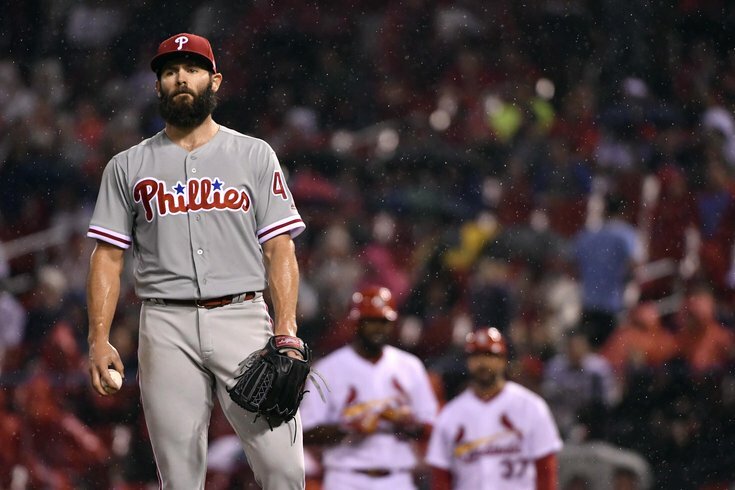 The Phillies shelled out a small fortune (well, small by MLB standards) to sign Jake Arrieta late this spring to a three-year, $75 million deal and his stats — 5-6 and a 3.54 ERA — are mediocre at best for a former Cy Young award winner. His month of June was positively dreadful, as his ERA for five starts during the month was 6.66. He has one of the lowest strikeout rates in all of baseball. Which reasonably begs the question: Does Arrieta at age 32 still have top of the rotation stuff? There are a bevy of mitigating factors, however, that bode well for a quick recovery — or in fact argue he isn't actually playing that badly. In his most recent start, a five-frame no decision in an extra innings win over the Nationals, Arrieta allowed an unearned run (in addition to two of the earned variety). In the start before, an error by Cesar Hernandez led to three unearned runs in a 6-0 loss to the Yankees. During his forgettable June, eight unearned runs crossed the plate while Arrieta was on the hill. You can't blame the poor guy for that. Which is why he's more or less gotten a pass after lashing out at manager Gabe Kapler for his defensive alignments. “I think it’s always difficult when you get a ground ball and we’re not able to make a play behind it," Gabe Kapler said recently, via NBCSP. "At the same time, Jake is Jake for a reason — because he’s able to weather those kinds of storms. That’s why he’s so important to us because he’s able to come back from those situations and get big outs." Arrieta gives up a lot of ground balls. It's sort of his specialty. His ground ball to fly ball ratio this season is 1.26, the fourth highest in all of baseball. Despite being 64th in innings pitched, the righty has provoked the sixth most ground balls of any starter. Ground balls not only bring with them more errors than fly balls, they also typically result in fewer runs scored than line drives or fly balls (which include home runs). Due in part to the errors, and to the volume of balls in play he's allowed with his 6.17 strikeout per nine ratio, Arrieta hasn't gone deep into games. But there's another reasonable beef Arrieta has with his teammates — lack of run support. Arrieta has the 21st fewest run support of every pitcher in baseball, substantially lower than the more than 20 pitchers who receive five runs support per game or more. There are still two and a half years left on Arrieta's deal in Philadelphia and it's far to early to proclaim he's lost his stuff. Advanced metrics (and his 5-2 start to the season) suggest he still has the ability to lead a rotation in the majors. And with the ascension of Cy Young candidate and likely All-Star Aaron Nola, the Phils only need Arrieta to be a solid No. 2. Expect the rule of large numbers to be kinder to Arrieta as the season continues.